This doesn’t look like much now, just the shabby back side of the old Albany building at 420 Third Ave. S.W. But it won’t look like this for long. 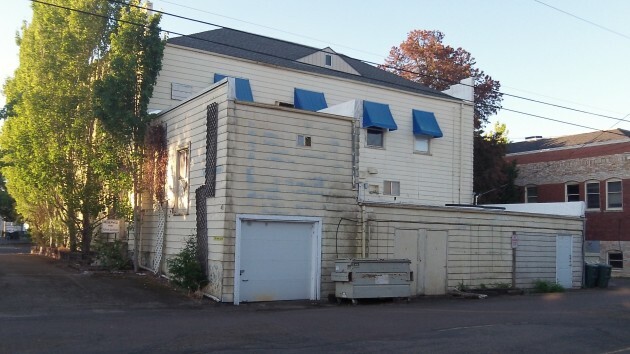 This past March, developer Scott Lepman got approval of a $336,000 contribution from CARA, the Central Albany Revitalization Area, toward what he estimates will be a $1.6 million project to rehabilitate this building for apartments and offices and construct a set of four townhomes on the lot next door (the left of the photo). Among other things, the plan calls for the low structure at the alley side of the building seen here to be turned into four garages. Also, the aluminum siding is to be replaced with cement siding, and the entry stairs on Third Avenue will be modified. In the renderings available online, the proposed paint scheme looks like gray with white trim.